Is there a way to block them from your e-mail? haha, they want the Republican party to charge into Burma and start yet ANOTHER foreign war? Hasn't anyone learned that Republicans are the LAST people on Earth you want in charge of nation-building? This is giving me flashbacks to pub quiz at Netroots Nation. Again, what is truly stupid about these Burmese demands is that they insulted you and claimed that your polls are biased in the other email that you posted. Nothing about that approach makes any sense. 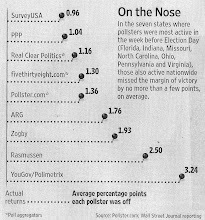 If the polls are biased, why do they want free biased polling data? And saying that PPP is "afraid" to poll their preferred States is remarkably stupid considering that you have already polled those States. "Why is your polling firm so afraid of conducting the US Senate Poll for Virginia and Missouri?Is the Democratic Party defeated in the polls for June,2011?" "To sum up,the Public Policy Polling should know that we are not satisfied with the polls for Virginia and Missouri for May,2011." Maybe they should ask for a refund of the entire amount that they spent on those May polls - which would be nothing. Anyone care about Netroots? Nope. A forgery tells a lie about itself. In essence, a counterfeit boarding pass allegedly printed by or for the airline is not so printed. These alleged Burmese dissidents know far too much about American politics -- surely more than the thug regime in Burma wants them to know. They would not know much about the behavior of polling firms.